Never thought I had to publish this post! After my BTech, when I started working, I realized that very little of what was taught during my undergrad (at supposedly one of the top institutes in the country) was useful in the real world. At UCLA, I felt that the graduate education is so much more meaningful since it is very close to real stuff out there and so was my research - hands on. For joining IIIT-D, one of the primary reasons was the enthusiastic colleagues who were striving to change the undergrad curriculum and make it more meaningful for the next generation. I felt that here is an opportunity to provide my younger friends with something I felt was missing in my undergrad education. After teaching the PhD level course last semester, I had an opportunity to teach the 3rd year students a course which would have been more meaningful for me with a smaller class size and more interested students. But when there was a discussion of redesigning the system management course and teaching it to the first year students, I got excited and opted for it. Here was an opportunity to teach the students fresh into college, the skills and tools that from my experience are very useful all through the education (and your professional career if you opt for a technical one) but are usually never taught in a class room setting. A lot of thought went into not just deciding the curriculum but the way teaching should be done. I had always argued with my colleagues and have passed on the same message to all of you that I consider you all as adults - who know what is good and what is bad for your own self; who understand if the other person is working hard for you and have the capacity to reciprocate; who would enjoy the freedom and responsibility given to them (that was often missing when I was a student); and who would love the fun filled teaching style. Most of you seem to be corrupted beyond a position of return. And the rest of you follow the suit by not raising a voice against it. The person committing the wrong deed is probably your friend and by letting him do it, you are not abiding by the true rules of friendship but actually going against it. College life indeed is fun and I will be the first one to vouch for it. I thought I could design a course that could make it even better. It is for that purpose, I included the individual assignment so that you will be forced to take out time for doing something you always wanted to do but it took a backseat. It is for this purpose I thought if you guys can learn better by trying to create a play/video out of whatever you learn in the class. All this means extra work for me as well. I can very easily come and speak up in the class, leave, take exams and then just grade in the end. I never got the sort of feedback I expected. But I still thought that it will take you all some time to adjust and was always willing to give you guys that breathing space. There should be some principles in everyone's life that one should always adhere to - no matter what. If you are not interested in the course, accept a lower grade and you should be able to justify it later. Grades do not matter in the long run, principles do. And it is often almost impossible to unlearn things as you grow older. You are in that critical moment of your life when you can question how things have been in the past and create a vision about how you want them to be. If you do not create these set of principles for yourself, you will be leading a hollow life all through. And the sad part is that the realization of this will occur when it is already too late. I hope at least some of you will do certain introspection after what happened today. It was just a small quiz, probably I wouldnt even have included the score in the final evaluation. And cheating to get a few extra marks may just seem to be not a big deal. The act indeed is not. But the idea that you didnt feel bad while doing it is indeed wrong. Hope you dont learn too many such things which become baggage for the rest of your life since very soon it will be too late to unlearn. U can view all open windows in stunning style with a single keystroke. We can say expose is a sort of feature that unshuffles overlapping windows on your desktop into an organized thumbnail view, so you can quickly locate and switch to any window or get to any file on the desktop. This feature is the one which attracted the whole class during one of the lectures of Amarjeet sir. Faster to wake up and shut down. 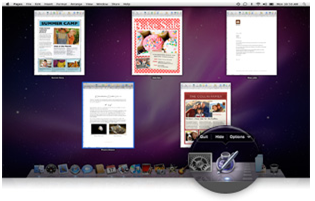 With Snow Leopard, your Mac wakes from sleep up to twice as quickly when you have screen locking enabled. And shutting down is up to 80 percent faster which saves lot of time. In general it is not easy to edit a pdf file without having a particular software but with advanced features of snow leopard, it is available with OS itself. 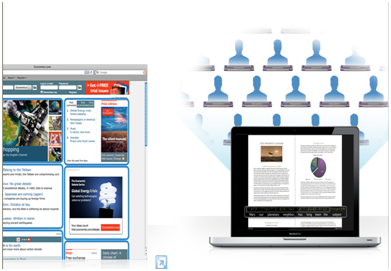 The Bonjour technology in every Mac makes file and media sharing virtually effortless. 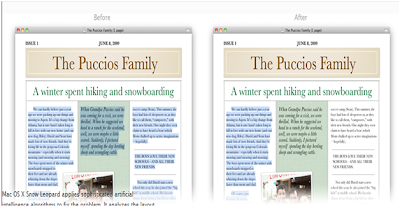 Now Bonjour in Snow Leopard makes sharing more energy efficient. If you have a computer in your home or office that shares files — like media files for your Apple TV — you have to leave the computer on all the time, which isn’t very energy efficient. With Snow Leopard and a compatible AirPort Extreme or Time Capsule base station, however, your computer can go to sleep yet continue to share its files with other computers and devices, waking when you need it and sleeping when you don’t. 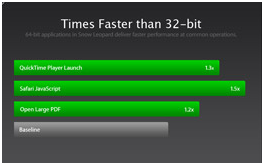 Snow Leopard improves the reliability of ejecting discs and external drives. Sometimes when an application or process is using the files on a drive, Mac OS X prevents you from ejecting it, but you don’t always know why. In Snow Leopard, you’ll get fewer of those errors and when you do get them, you’ll see exactly which application is using the drive, so you can quit it and eject the drive properly. Automatic updates for printer drivers. Snow Leopard makes sure you always have the most up-to-date driver so you can get the most from your printer. When you plug in a printer, Mac OS X can download the latest driver available over the Internet. And it periodically checks to make sure it has the latest driver. If not, it downloads the newest version through Software Update. The right service at the right time. The entire computing industry is moving from 32-bit to 64-bit technology, and it’s easy to see why. Today’s Mac computers can hold up to 32GB of physical memory, but the 32-bit applications that run on them can address only 4GB of RAM at a time. 64-bit computing shatters that barrier by enabling applications to address a theoretical 16 billion gigabytes of memory, or 16 exabytes. It can also enable computers to crunch twice the data per clock cycle, which can dramatically speed up numeric calculations and other tasks. Earlier versions of Mac OS X have offered a range of 64-bit capabilities. Now Snow Leopard takes the next step in the transition from 32-bit to 64-bit. Built-in applications like finder,mail,safari,ical,& ichat are now 64-bit which increases speed & eficiencyfor the future. The 64-bit support in Snow Leopard completely ready for whatever computing enhancements might arrive in the future. For example, Snow Leopard is ready to support up to 16 terabytes of RAM — about 500 times more than today’s Mac computers can accommodate. This spl feature which enables computer to receive commands verbally. 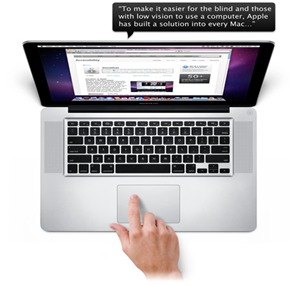 It is also beneficial for blinds because of the control your computer using gestures on a Multi-Touch trackpad even if you can’t see the screen. The trackpad surface on your Mac notebook represents the active window on your computer, so you can touch to hear the item under your finger & can , drag to hear items continuously as you move your finger, can hear how items are arranged & lot more. 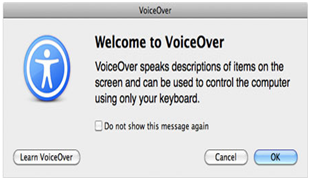 Voice over offers easier & faster web browsing, it can read the whole web page by just accepting gestures . Snow Leopard fully supports HTML web tables without the need for a forms or table mode. You navigate tables using the same commands you already know. You can hear the contents of a table, including the column title and column and row number, by dragging your finger across the trackpad or using simple keystrokes. It also includes vice over tutorial . Snow Leopard introduces a new feature, called braille mirroring, that enables multiple USB braille displays to be connected to one computer simultaneously. It’s perfect for classroom settings, where teachers can lead all of their students through the same lesson at the same time, even if the students are using different display models. There are so many other features but its already too long as a blog so I have to restrict myself here only with a warm welcome to all sort of comments & questions which can help to improve & enhance knowledge. GPGPU as the name suggests is termed "General Purpose computation on Graphics Processing Units". This is a technique of using a GPU, which is usually used for rendering computer graphics to perform computations of extreme orders which are traditionally handled by a CPU. To this date, CPUs are known to have a maximum of 12-cores (AMD Opteron 6000 series and Intel Xeon processors) whereas graphics cards these days come with approximately 240+ cores. 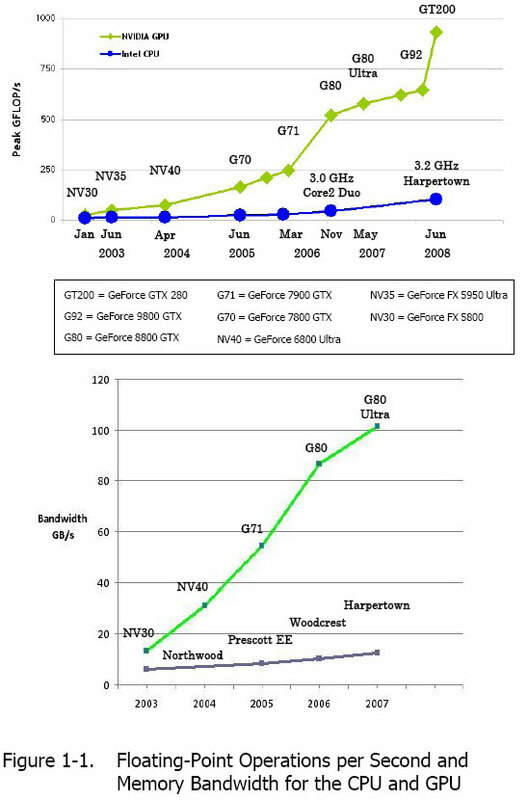 So you can imagine why there is a growing necessity to use a GPU for computational purposes. By using a GPU, a normal person can turn his/her Personal Computer into a Personal "Super" Computer. GPGPU aims at the application developer modifying the application to take the compute-intensive kernels and map them to the GPU. The rest of the work is handled by the CPU. To perform mapping the developer has to rewrite the functions to expose the parallel-ism in them i.e. The developer has to re-write the code to use parallel computing. 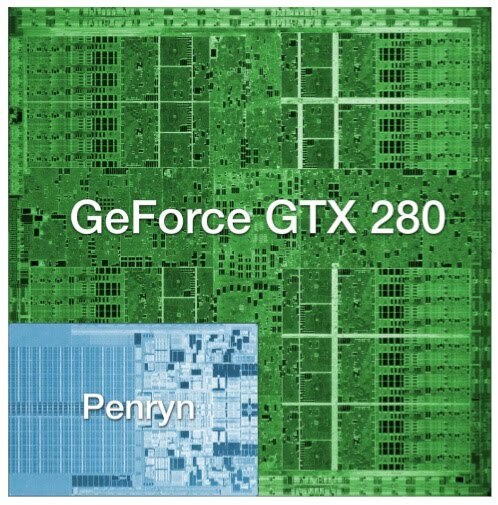 NVIDIA uses it's very famous CUDA (Compute Unified Device Architecture) to infuse it's GPUs with the extraordinary compute power. 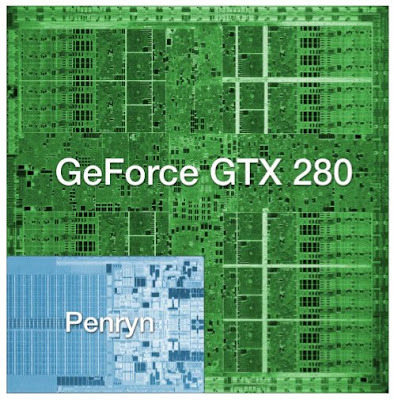 GPUs powered by the Fermi-generation of the CUDA architecture Delivers cluster performance at 1/10th the cost and 1/20th the power of CPU-only systems based on the latest quad core CPUs. 448 CUDA Cores Delivers up to 515 Gigaflops of double-precision peak performance in each GPU, enabling a single workstation to deliver a Teraflop or more of performance. Single precision peak performance is over a Teraflop per GPU. ECC Memory Meets a critical requirement for computing accuracy and reliability for workstations. Offers protection of data in memory to enhance data integrity and reliability for applications. Register files, L1/L2 caches, shared memory, and DRAM all are ECC protected. Desktop Cluster Performance Solves large-scale problems faster than a small server cluster on a single workstation with multiple GPUs. Up to 6GB of GDDR5 memory per GPU Maximizes performance and reduces data transfers by keeping larger data sets in local memory that is attached directly to the GPU. NVIDIA Parallel DataCache™ Accelerates algorithms such as physics solvers, ray-tracing, and sparse matrix multiplication where data addresses are not known beforehand. This includes a configurable L1 cache per Streaming Multiprocessor block and a unified L2 cache for all of the processor cores. NVIDIA GigaThread™ Engine Maximizes the throughput by faster context switching that is 10X faster than previous architecture, concurrent kernel execution, and improved thread block scheduling. Asynchronous Transfer Turbocharges system performance by transferring data over the PCIe bus while the computing cores are crunching other data. Even applications with heavy data-transfer requirements, such as seismic processing, can maximize the computing efficiency by transferring data to local memory before it is needed. CUDA programming environment with broad support of programming languages and APIs Choose C, C++, OpenCL, DirectCompute, or Fortran to express application parallelism and take advantage of the “Fermi” GPU’s innovative architecture. NVIDIA Parallel Nsight™ tool is available for Microsoft Visual Studio developers. High Speed , PCIe Gen 2.0 Data Transfer Maximizes bandwidth between the host system and the Tesla processors. 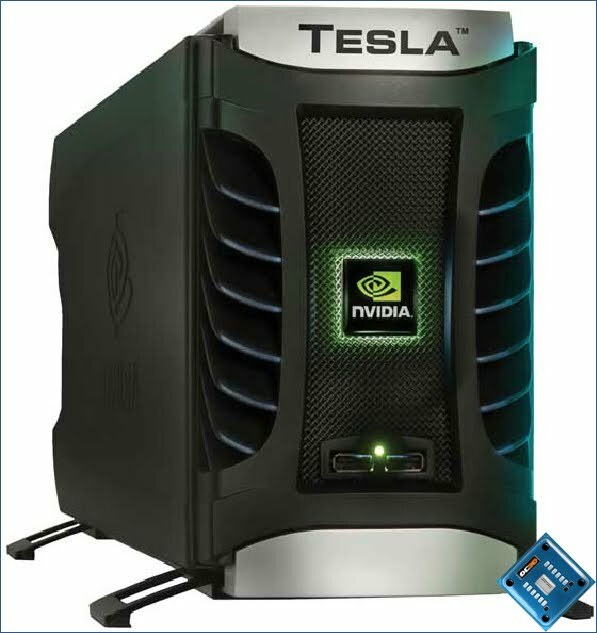 Enables Tesla systems to work with virtually any PCIe-compliant host system with an open PCIe x16 slot. Fig. 2. 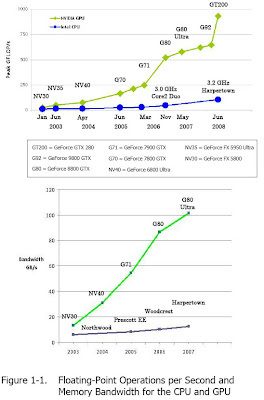 A pictorial representation of the difference in performance between a CPU and a GPU over the years. Applications of GPU computing are many including MATLAB acceleration, physical based simulation and physics engines, Tone mapping, Audio Signal processing, Computational Finance, Data Mining, Analytics and Databases, Molecular Dynamics, et cetera. I hope this post wasn't too mind-boggling. Queries and Comments are always welcome. It comes as no surprise that even after the biggest graphics card revolution, most Indians are still unaware of such cards. Most of us tend to neglect this component when buying a personal computer. Later on, they whine about the "pathetic" graphics their monitor displays and they tend to get the monitor replaced (though this is not a common case). What's the use of a graphics card? For normal users : A graphics card allows them to use the power to render images extremely fast and with the best quality. Since the release of Microsoft Windows Vista, Aero has become extremely popular. But Aero requires a graphics card to render properly. The in-built video accelerator is insufficient for this purpose. For entertainment fanatics : Entertainment fanatics always look forward to getting the best quality from their digital stuff eg. Movies, Television shows, et cetera. A graphics card allows such people to use it to accelerate such videos and render them in high quality!! A normal video accelerator will have trouble rendering videos in resolutions of 1280x720 or greater. For casual gamers/pro gamers : A graphics card is a component of utmost importance to such people. Without a graphics card, no game released in recent times would work on a computer. Why? 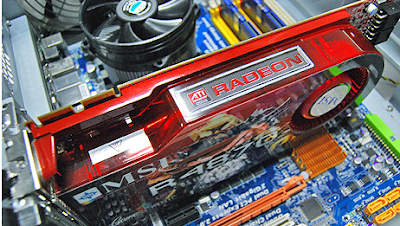 Both are available in 1 GB GDDR3 versions and the HD 4670 costs less than the HD 4770. Ans. Each graphics card has a GPU. Each GPU is different in terms of computational power. The GPU of a graphics card costing <> Rs. 4500 even though the memory in both is the same. Graphics cards above this price range are meant for those who'd rather spend money on the graphics card for showing off rather than for performance.The price/performance ratio goes up significantly for such graphics cards (a lower price/performance ratio implies better performance for price). Its clearly legend (Microsoft ) vs icon (Google) . The battle escalated this year as the two high-tech titans went after each other's market share and revenue stream in Internet search, operating system , enterprise applications and broswers . Both are looking for dominant positions in the Internet. For Google to increase its business, it needs to move into other territory. For Microsoft to have significant growth opportunities, it needs to become an Internet powerhouse, and they know it. This is not a war that is going to be won by one or two battles. This is going to be a prolonged activity. The battle isn't simply over which can be called top dog, because the fight is critical to both companies. Google, one of the great Internet success stories, has grown into an online crusader. With a name that has evolved into a verb meaning "to search," Google grown so much that it has become a threat to Microsoft, which has had a long and storied history of high-tech industry dominance. There was a time not so long ago when few believed that any company could rattle Microsoft, let alone a Web company like Google who has unbelievably turned into a brand with its revolutionary search engine. Google has rattled Microsoft's cage and, in turn, the software giant has set its sights on taking its new rival down a notch or two. Microsoft has spent millions of dollars and used countless manpower hours to grab a chunk of Google's search market share and topple the Web company from its new lofty perch above the high-tech industry - eliminating the threat to Microsoft's longheld industry dominance. The reason that Microsoft is so focused on Google is because Google is chipping away at Microsoft's crown jewels of Office and Windows with their online applications. Search is the key to Google's success since Web ads account for more than 90% of its revenue. If you can steal some eyes from Google's search engine, you cut into their ad revenue and, perhaps over time, cripple them." In desperation microsoft launched BING its own search engine to tame google's market. But make no mistake about it - Google still search marketThis back and forth between the two companies intensified when Microsoft overhauled its far-from-beloved Microsoft Live Search and released the update, BING search engine in June. with a share of more than 64%. But Microsoft's Bing has failed to fail. The new search service has largely been gaining steam, albeit in small increments, but gaining nontheless. Microsoft has more reason to hope that Bing will take a significant chunk out of Google search since the company announced plans over the summer YAHOO , which holds the second-place spot in the search market - nestled snugly between Google and third-place Bing. The deal, which still has to be approved in the U.S. and in Europe, would have Yahoo give up its own search technology to use Microsoft's. Pooling their resources and industry might, the two companies hope to do together what neither has been able to do alone - significantly make gains on Google's ubiquitous search. The search battle heated up this fall when both companies announced they had struck individual deals to serve up real-time search results. Microsoft will be offering users real-time tweets from Twitter and posts from Facebook, while Google has already begun working with Twitter to offer up tweets in its search results. The Google/Microsoft fight also extends into the browser arena with GOOGLE CHROME going up against Internet Explorer. Google also announced that it's working on the Linux-based Chrome applications , which, if widely adopted, could help users see Google's Apps offering as a viable alternative to Microsoft's Office suite. Both companies are largely betting their collective futures on this battle so the stakes are huge.Microsoft is going to partner and try to starve Google out of content and partners. Google is going to work against Microsoft's pricing model and starve them out of money. Both are, for once, largely going after each other's relative weaknesses and leveraging their respective strengths, so this will likely be a battle for the history books. Finally I would say that after 25 years dominating the software market and winning battles against APPLE ,YAHOO , LINUX on many fronts Finally it has got a competetor which can make him run for the money just like today we have in cricket.REMEMBER : (AUS and INDIA ) haaa. All i have done is simplified the language and cut out the unnecessary details. (There may be a mixture of we's and you's that clearly indicate some of it has been typed and some of it has been simply copy pasted. i will not try to fool you guys into thinking i typed the whole thing). This is mainly for installing linux on computers with windows already installed. It's main use is if you want to constantly upgrade to a newer version of linux without wasting cds. Almost all Linux installers uses two files to boot the computer: a Linux kernel(about which sir talked about recently in SM class), and an initial root file system containing a minimal set of directories that is mounted prior to when the real root file system is available. This initial root file system is also called Ram disk (initrd). We will use these two files to boot our PC. 1. First we need to copy the ISO file of Linux to our hard disk . Make sure that the partition is FAT32 unless the distro( you are installing has native NTFS read/write support. It's best to copy the iso to the root of the partition because otherwise, the setup might not be able to detect it. 6. Now you have to add grub to your c:\boot.ini file. You can open boot.ini by clicking on Start>Run and typing c:\boot.ini. If Windows does not allow the file to be modified, then go to Control Panel>System and click on the Advanced tab. Now under Startup and Recovery click Settings and then under System Startup click Edit. Open boot.ini and add this line in the end. 7. You are now ready to install Linux. Restart your PC and from the boot screen select "Start GRUB". This will load GRUB. From the grub screen select "Install Linux". During the setup you will be asked the source of installation. Choose hard disk and then select the hard drive partition where you copied the ISO files. Sometimes you might have to type the whole path of the partition and the exact name of the ISO. So write it down before you begin. Honestly I haven't personally tested anything but again the source from where i got this info said"I have personally tested this with Fedora, Suse and Mandriva and it works without problem. I have no doubt it will work for others too" so i think everything should be fine. i am blogging on power on self test which we did in our 2nd lab session. The first thing that the BIOS does when it boots the PC is to perform what is called the Power-On Self-Test, or POST for short. The POST is a built-in diagnostic program that checks your harware to ensure that everything is present and functioning properly, before the BIOS begins the actual boot. It later continues with additional tests (such as the memory test that you see printed on the screen) as the boot process is proceeding. The POST runs very quickly, and you will normally not even noticed that it is happening--unless it finds a problem (amazing how many things are like that, isn't it?) You may have encountered a PC that, when turned on, made beeping sounds and then stopped without booting up. That is the POST telling you something is wrong with the machine. The speaker is used because this test happens so early on, that the video isn't even activated yet! These beep patterns can be used to diagnose many hardware problems with your PC. The exact patterns depend on the maker of the BIOS; the most common is AMI BIOSes. This part of the Troubleshooting Expert will help you figure out what the POST beep codes mean and what to do about them, if you are having this problem. Note: Some POST errors are considered "fatal" while others are not. A fatal error means that it will halt the boot process immediately (an example would be if no system memory at all is found). In fact, most POST boot errors are fatal, since the POST is testing vital system components. Many people don't realize that the POST also uses extended troubleshooting codes that you can use to get much more detail on what problem a troublesome PC is having. You can purchase a special debugging card that goes into an ISA slot and accepts the debugging codes that the BIOS sends to a special I/O address, usually 80h. The card displays these codes and this lets you see where the POST stops, if it finds a problem. These cards are obviously only for the serious PC repair-person or someone who does a lot of work on systems. Below are the AMI BIOS Beep codes that can occur. However, because of the wide variety of different computer manufacturers with this BIOS, the beep codes may vary. This table is also present in the slides available on amarjeet sir's website but links are given here . the following links show the problem, the cause of the error and how to correct it. for any questions or queries, please do write . SORRY, THIS BLOG CAME 1 DAY LATE. I WOULD LIKE TO START THE BLOG BY RAISING A QUESTION - WHAT IS PARITY BIT ? PARITY BIT IS A BIT THAT IS ADDED TO THE CODE FOR THE DETECTION OF ERROR DURING THE TRANSMISSION OF THE CODE. PARITY BIT IS GENERALLY ADDED TO THE LEFTMOST SIDE OF THE CODE. THERE ARE TWO TYPES OF PARITY-EVEN PARITY AND ODD PARITY. IN EVEN PARITY, THE BIT ADDED IS SUCH THAT THE NUMBER OF 1s IN THE CODE IS EVEN AND IN ODD PARITY, THE BIT ADDED IS SUCH THAT THE NUMBER OF 1s IN THE BINARY CODE IS ODD. NOW, I WOULD TO THROUGH SOME LIGHT ON HOW PARITY BIT CAN BE USED FOR THE DETECTION OF ERROR DURING THE TRANSMISSION OF THE CODE. GENERALLY, AN EVEN PARITY IS CREATED AT THE TRANSMISSION END BY THE ADDITION OF DESIRED BIT. THEN, THE CODE IS TRANSMITTED AND THE PARITY OF THE CODE IS CHECKED AT RECEIVING END. IF THE PARITY OF THE CODE HAS CHANGED FROM EVEN TO ODD, THEN, IT MEANS THAT EITHER 1 OR 3 OR AN ODD NUMBER OF BITS ( EXCEPT THE PARITY BIT ) IN THE CODE HAVE CHANGED THEIR VALUES DURING TRANSMISSION. BUT, IF THE PARITY OF THE CODE REMAINS SAME, THEN THERE ARE TWO POSSIBILITIES THAT EITHER THE CODE IS SAME (MORE PROBABLE) OR AN EVEN NUMBER OF BITS HAVE CHANGED THEIR VALUES DURING TRANSMISSION( LESS PROBABLE ). THIS IS THE LIMITATION OF THE PARITY BIT. BUT THE CASE OF EVEN CHANGES OF BITS HAPPENS QUITE LESS TIMES, HENCE, THE PARITY BIT METHOD IS A GOOD WAY TO DETECT ERROR IN THE CODES DURING TRANSMISSION. I WOULD LIKE TO EXPLAIN THE ERROR DETECTION PROCESS BY AN EXAMPLE - SUPPOSE 0110001 IS THE CODE TO BE TRANSMITTED(NOTE THAT NUMBER OF 1s IN CODE IS ODD ). NOW, BY ADDING 1 TO THE LEFT OF THE CODE, THE CODE BECOMES EVEN PARITY AND THE NEW CODE IS 10110001. THIS CODE IS TRANSMITTED TO THE RECEIVER WHERE ITS PARITY IS CHECKED. IF THE CODE RECEIVED IS 10100001, THEN , IT MEANS THE PARITY HAS BECOME ODD WHICH CAN BE DETECTED. BUT, IF THE CODE RECEIVED IS 11100001, THEN, THOUGH TWO BITS HAVE CHANGED THEIR VALUES DURING TRANSMISSION, BUT THE PARITY OF THE RECEIVED CODE IS SAME , SO SUCH KIND OF ERRORS CANNOT BE DETECTED USING PARITY BIT. IF YOU HAVE ANY QUESTION TO ASK OR ANY ADVICE ON HOW TO MAKE THIS BLOG MORE INTERESTING, THEN FEEL FREE TO COMMENT . I wanted to know what is FSB? what are its physical significance & where is it located?? PARITY BIT is a bit that is added to ensure that the number of bits is even or odd. and if the occurence of 1's is even no of times then we add a zero to make it even. In the odd parity , if data bit consists of odd no of 1's we add a zero to it to make it odd. similarly if data bit consists of even no of 1's we add a 1 to make it odd. Even parity is a special case of a cyclic redundancy check (CRC), where the 1-bit CRC is generated by the polynomial x+1. If the parity bit is present but not used, it may be referred to as mark parity (when the parity bit is always 1) or space parity (the bit is always 0). first of all look into your phone's manual and find what are the video formats supported and what is your screen resolution. if you love to watch clips or songs on your cell log on to www.effectmatrix.com and download total video converter. 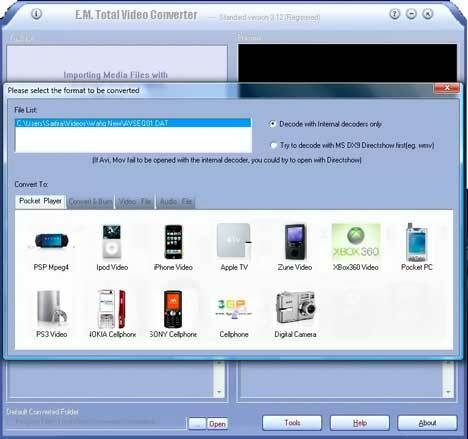 It is an excellent converter which gives superb video aand audio quality.import files and convert them.You can set the quality screen size etc,if not sure jast select your phone model(if nokia and sony),explore the options. Movies take a lot of time to convert so you have to compromise with quality,just use freez 3gp converter avaliable on smallvideosoft.com,believe me its the fastest . I have converted a whole dvd by freez in just 38 min 25 seconds ! !